The Archangels have brought great peace and harmony to me and my loved ones during time of need. They have provided the guidance I needed in times where clarity was lacking. They assist me with my vocation as a life coach. It is for these reasons I provide the following information for you and your loved one's, so that you too may seek directly from the source, the joy, love, guidance, and support of our magnificent and loving Archangels. I feel particularly honored that Saint Germain, keeper of the violet flame, walks with me on my path as a life coach. 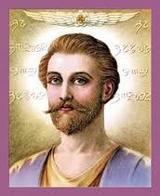 Blessings and love to Saint Germain and all the angels and saints who serve so lovingly and freely! Michael's name means "He who is with God". Or "He who looks like God". His chief intention is to rid the earth and its inhabitants of the toxins associated with fear. Michael gives guidance and direction for people who are stuck or lost with respect to their life's purpose or path. Defender of the element of Fire, Michael represents the south. Leader of the Archangels, he is the Angel of protection, justice, and strength. Archangel Michael represents the Northern Quarter, the season of Autumn, and the Red. For an invocation to bring Michael into your life click here. Uriel's name means "God is light" God's light" or "God fire", because he illuminates situations and gives prophetic information and warnings. Perhaps because of his connection to Noah, and the weather elements of thunder and lightning, Uriel is considered an Archangel who helps with natural disaster. Call upon him to avert such events, or to heal and recover in the aftermath of such an event. Uriel is the defender of the element of the earth, and north. Angel of nature, visions, and instruction, and the custodian of prophecy. Archangel Uriel represents the quarter of East, the season of Summer, and White. For an invocation to call him to you click here. Archangel Raphael's name means "God heals" or "God has healed" based upon the hebrew word Rapha, which means "doctor" or "healer". Raphael is a powerful healer of physical bodies, both for humans and animals. Defender of the element of air, and the East, he is the angel of love, joy, and laughter, custodian of the tree of life and healing powers. Archangel Raphael represents the quarter of West, the season of Spring, and the color of Blue. For an invocation to bring the energy of Raphael to you click here. Metatron is a fiery, energetic angel who has a special place in his heart for children, especially those who are spiritually gifted. After the exodus, Metatron led the children of Israel through the wilderness and onto safety. He continues to lead children today, both on earth and in heaven. For an invocation to bring his energy to you please click here. The Count of St. Germain has been variously described as a courtier, adventurer, charlatan, inventor, alchemist, pianist, violinist and amateur composer, but is best known as a recurring figure in the stories of several strands of spiritualism - particularly those connected to Theosophy and the White Eagle Lodge, where he is also referred to as the Master Rakoczi or the Master R and as one of the Masters of the Ancient Wisdom, is credited with near god-like powers and longevity. Some sources write that his name is not familial, but was invented by him as a French version of the Latin Sanctus Germanus, meaning "Holy Brother." Saint Germain is known as the keeper of the violet flame, the highest arch of Universal light energy. To invoke the violet flame please click here.